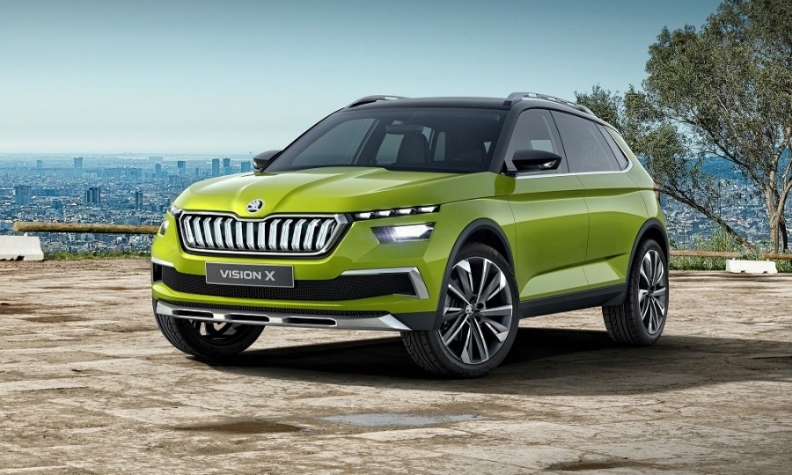 The Vision X concept previews Skoda's new small SUV, which will be a key model in the brand's quest to increase its global sales to 2 million by 2025 from 1.2 million last year. Skoda's record sales and profits hide headwinds for the automaker that turned itself around from a derided Communist-era relic selling low-cost cars into one of the most successful brands in Volkswagen Group's sprawling empire. Skoda faces the challenges of balancing its aggressive growth plans with the increasingly strident pay demands of workers in its two overstretched factories in its Czech home country. 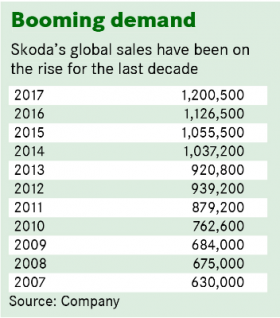 Since 2007, Skoda has nearly doubled its vehicle sales to 1.2 million (by gaining ground in key western European markets such as Germany and through rapid growth in China, which is now its single-largest market. Record deliveries last year generated 16.6 billion euros in revenue, also a record, and an operating profit of 1.6 billion euros. That translated into an operating margin of 9.7 percent, making Skoda one of the industry's most profitable automakers and putting it ahead of VW Group's traditional earnings powerhouse, Audi. Skoda wants to increase its annual vehicle sales to 2 million by 2025, helped by expanding further into popular SUV segments. Just 15 percent of Skoda’s sales last year in Europe were SUVs, according to market researcher JATO Dynamics, well below the 28 percent average in the region. Next year, Skoda will add a small SUV based on the Vision X concept that premiered at the Geneva auto show in March. The model will join the compact Karoq and midsize Kodiaq. In China, Skoda plans a small SUV on a cheaper platform designed for the local market and will add a sportier five-seat version of the Kodiaq later this year. Another new SUV for China will follow in 2019, CEO Bernhard Maier told journalists at the automaker's annual financial results press conference in March. Skoda will decide by mid-year whether to develop a low-cost version of VW Group’s MQB A0 small-car platform to underpin cars aimed at budget-conscious markets such as India. If produced, those models would go on sale around 2021. If Skoda gets it right, it could finally crack the Indian market, which is closing on Germany to become the world's fourth biggest. Skoda also has electric ambitions. By 2025, the company aims to sell five full-electric cars, led by an SUV due to start production in 2020 at its flagship plant of Mlada Boleslav, 50 km northeast of Prague. Those plans are ambitious but analyst firm LMC Automotive doesn't share Skoda's confident growth predictions, at least in the short term. Skoda's sales globally will stay flat this year and next, and increase to 1.4 million by 2021, LMC predicts. "Capacity issues in their European factories have been a constraint on growth," said David Oakley, European analyst for LMC. 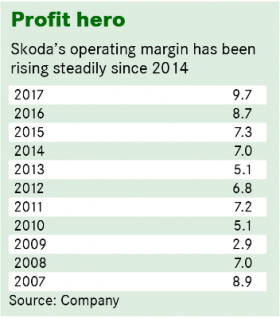 Lower wage costs in the Czech Republic have given Skoda a huge advantage compared with competitors building in higher-wage countries such as Germany, but that advantage is shrinking as unions demand and receive greater pay increases. Last year Skoda employees won a 10 percent wage increase and in April unions accepted a further 12 percent boost after threatening strikes. Unions have the upper hand in a country where employers struggle to fill jobs, often having to look to neighboring countries to find workers. That has pushed Skoda toward greater automation, which in turn increases costs. "If we want to keep growing the only way we can is via migration or automation," Maier said. The longer-term solution to Skoda's capacity constraints could be to build Skodas in other VW Group plants in Europe, or even import models from Russia, as Skoda has done in the past with the Yeti small SUV. If that doesn't work, building a third factory is an option, Maier said. He said the brand's increasing global reach will help it achieve its 2 million target by 2025 with a large proportion of the growth coming from China.